It has been a high honor to have been commissioned to design and build this exciting musical instrument for All Saints Church. 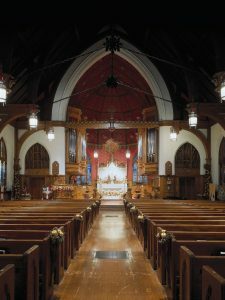 During the last year, three large downtown Atlanta churches commissioned important new pipe organs. 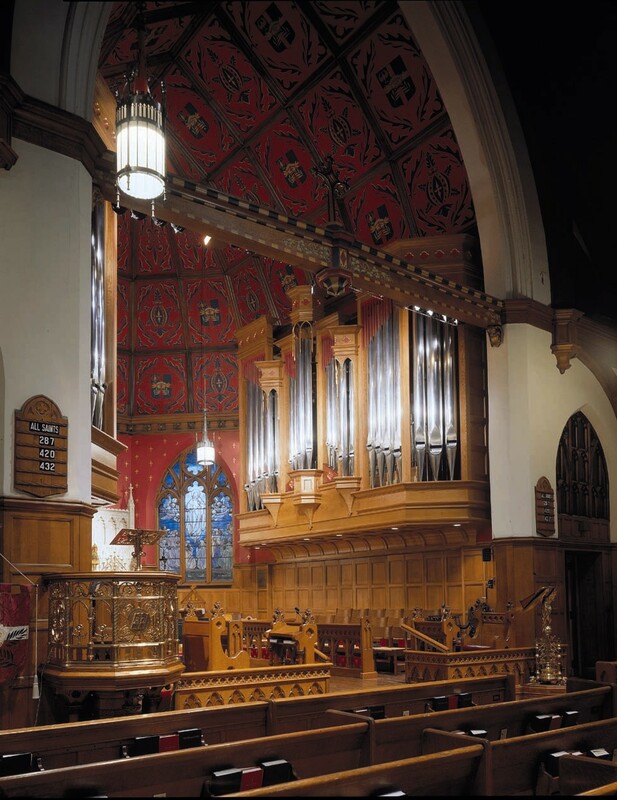 The fact that the All Saints organ is the only one of the three to be built by an American organbuilder made the honor of our selection all the more gratifying, but also added pressure upon us to perform at the highest possible level of organbuilding. 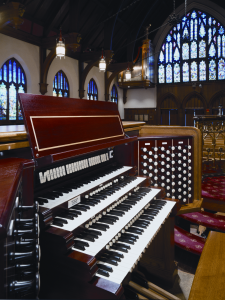 When first approached by Assistant Organist Jefferson McConnaughey some years ago concerning the design of this instrument, we were just becoming known in the organ world as a builder whose tonal style was very much inspired by the great organs in the English cathedrals. As our discussions evolved, and as Music Directors and Organists Raymond and Elizabeth Chenault became directly involved in the design, it quickly became apparent that all of us were of the same mind concerning the organ’s tonal and physical disposition. This instrument had to be eclectic to perform a wide range of music, but had to have tremendous personality and character. The stops all had to have vivid individual tone-color, but had to blend and balance each other seamlessly. Find more information about his new CD at this link! It was a high honor to have been commissioned to design and build this exciting musical instrument for All Saints Church. 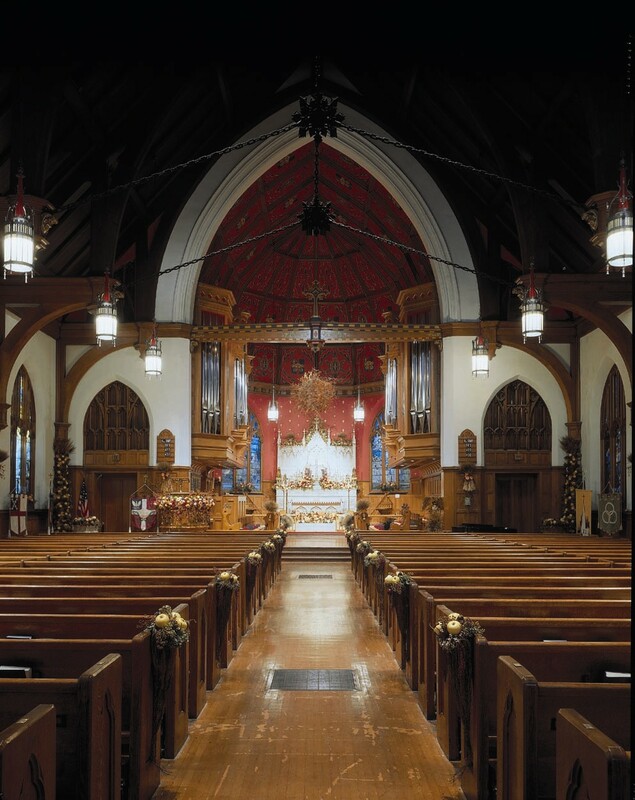 During the year in which this organ was commissioned, three large downtown Atlanta churches built important new pipe organs. 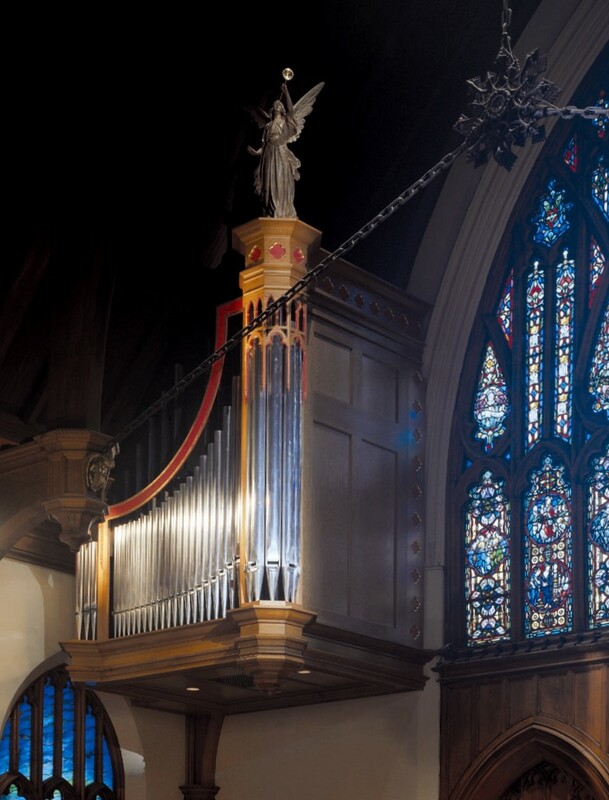 The fact that the All Saints organ is the only one of the three to be built by an American organbuilder made our selection all the more gratifying, but also added pressure to perform at the highest possible level of American organbuilding. 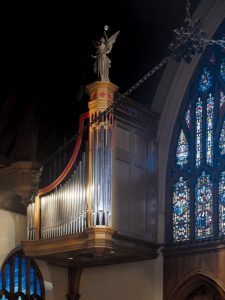 When first approached by then Assistant Organist Jefferson McConnaughey concerning the design of this instrument, we were just becoming known in the organ world as a builder whose tonal style was very much inspired by the great organs in England and the Continent. 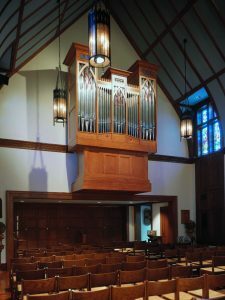 As our discussions evolved, and as Music Directors and Organists Raymond and Elizabeth Chenault became directly involved in the design, it quickly became apparent that all of us were of the same mind concerning the organ’s tonal and physical disposition, and the uses to which the organ would be put. This instrument had to perform a wide range of music, but had to have tremendous personality and character. The stops all had to have vivid individual tone-colors, but had to blend and balance each other seamlessly and in multiple contexts. All Saints is a large parish whose musical requirements are every bit as demanding upon its instrument (and its musicians) as a large metropolitan cathedral. This organ is essentially what I think a modern American Cathedral Organ ought to be. Although inspired by English Cathedral organs of certain builders, this is not an English Organ. This is an instrument which embraces our American musical sensibilities and is truly original, not derivative. In broad terms, the organ has to play a wide variety of literature, and support worship through accompanying and leading congregational singing. 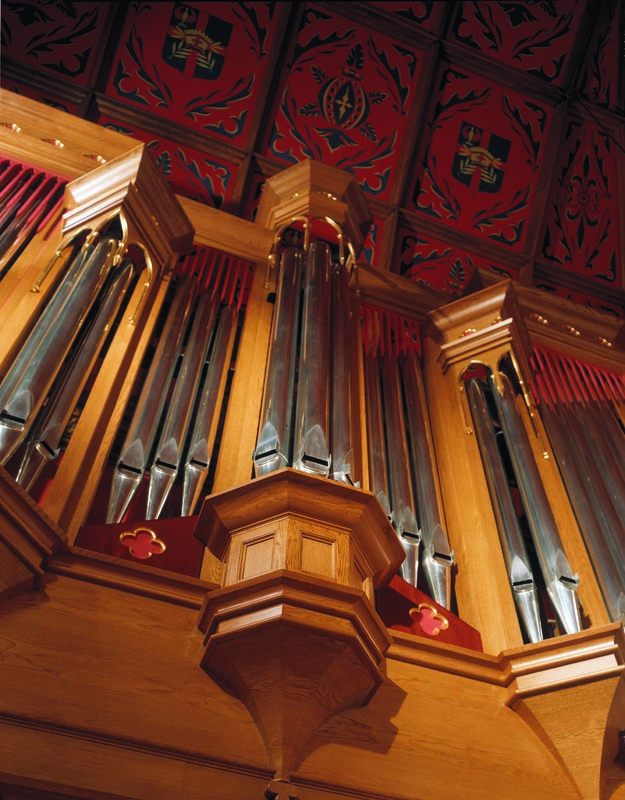 Scholarship in the design tells us that stops of certain tonal qualities need to be in specific locations in the organ in order to work properly in the many contexts in which we expect them to be used. Because this is a large instrument, we had the opportunity to include a wealth of soft stops to increase the organ’s accompanimental flexibility and dynamic range. We were able to include an entire chorus of soft Diapason-toned Dulcianas in the Choir Organ, along with lyric cantabile reeds and two celeste stops in the Solo Organ. In the Chapel Organ, besides a pair of 8’ and 4’ Principals for hymn-singing, we included a pair of very soft string-toned stops, an Aeoline and Vox Angelica, the likes of which haven’t been seen in organ specifications for many years. We were able to re-introduce a Harmonic Mixture to the Great Organ, whose primary function is to reinforce the higher harmonics of the flue work when the relatively dark Trombas are used, by virtue of the inclusion of the tierce and flat-seventh ranks. We have come to find, through its musically sensitive scaling and voicing, the Harmonic Mixture also adds an ancient Continental flavor to the Great plenum without the Trombas. 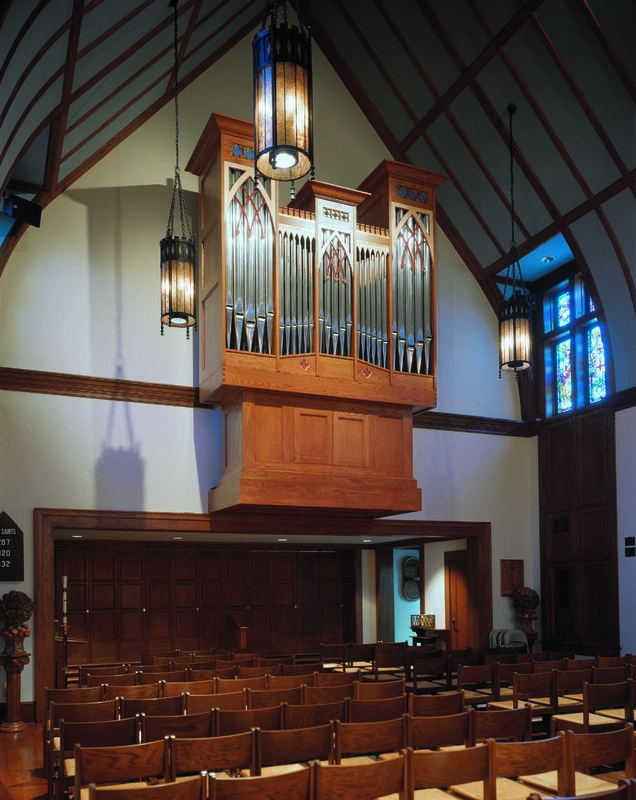 The visual design of the organ was a very crucial element to its success. We were challenged to design and build an organ of about three times the size as the former instrument – and make it look as though it had always been at home in the Church. I enjoyed working with Hugh Latta, a parishioner and respected interior designer, concerning the stain colors and the Chapel Organ’s design. We were all privileged to work with architects Jim Chapman and Jim Macht on the platforms used to support the organ cases, and with parishioner and then Senior Warden Paul Elliott in his role of coordinating our efforts with those of local contractors and woodworkers. It’s an honor for us that Ray Chenault has chosen to record his favorite organ pieces on this instrument. 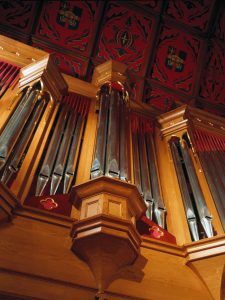 The fact that this organ can musically render French and Belgian repertoire, then accompany the choral repertoire of the Anglican Musical Tradition on a Sunday points to the special nature of our work in which science and craft always serve the musical ideal. In this way we hope that our instruments are seen as works of functional art by those who enjoy them. timbres in use of registrations and stops, and interpretive voice for each and every composer.